In this interview from 2010, Judith Leiber—handbag designer to red-carpet celebs, opera stars, and First Ladies—looked back on her rich and storied career. Leiber’s vintage evening bags can easily fetch thousands of dollars, and until her and her husband, Gerson’s, death in April 2018, Leiber was one of the most avid collectors of her iconic originals. The Leibers displayed the bags in the museum they founded in 2005 in East Hampton, New York. For more information, visit leibermuseum.org. When I was a girl, my mother had a lot of wonderful handbags. My dad traveled often in Western Europe. Every time he came home he brought her a beautiful bag. Some of the bags came from Vienna, where my mother was born and raised. She also had bags from France, England, and Spain. My father used to buy them from all over the place. Before the war, there were laws in Hungary that prevented Jews from going to university. If you were Jewish and wanted to attend a university, you had to go abroad. So my parents sent me to England. I was registered at King’s College to learn chemistry, but when I went home to Hungary one summer the war broke out and I couldn’t go back. So I decided I was going to learn a trade. I figured that after the war was over I would emigrate and live in the West somewhere. That’s how I got started at the handbag factory. I began my career as an apprentice. It was a very small, but very nice, factory in Budapest. That’s where I learned the trade. I would make a pattern for a purse and then cover it with mirrors. One of my tasks was to set up the glue in the morning. That’s what we used, not rubber cement like they used in the United States. I learned the trade from the bottom up. The factory was in a courtyard on a side street right behind the Ritz Hotel in the middle of town. About seven or eight people worked there, maybe 10, tops. It was a small place, very nicely done, and the man who owned it was the head of the Handbag Guild. The Chatelaine was very successful but you couldn’t put much in it—a credit card, a mirror, a hundred-dollar bill. I became the first woman to be accepted into the guild. You see, this was a man’s trade. Even in the United States it was a man’s trade. All the pattern makers were men. I was the first girl to try to learn the trade—I was about 18 years old at the time. I learned everything in that little factory, every operation, how to do it all. I could make my own patterns. At the time, the pocketbook makers in Hungary would make a pattern for a bag, but somebody else would cut the leather and skive it. That’s how things were done. But I could make the pattern and then make the bag, too. The owner’s wife would usually cut the leather, and then we would all help with the interlinings and putting it together. In the beginning, that tiny little place acquired all kinds of leathers. We worked in calfskin and silk, and we worked in alligator and lizard sometimes. But the work was very limited in that we only made three types of bags—a frame bag, a zipper, and an envelope. Those were the classic bags that they made in Hungary. Once I came to the United States, of course, it was very different. We made all kinds of things here. I worked there for about three years, and then the war got so bad you couldn’t travel anywhere if you were Jewish. You had to stay home. Collectors Weekly: When you first came to America, who were some of the best-known handbag makers? Leiber: There was Koret, Nettie Rosenstein, and Rosenfeld. There were quite a few very good companies. Today, of course, all this has changed. The Handbag Manufacturers’ Association still exists, but most companies are importing everything because they don’t make anything here anymore. Years ago, the principal of the company would be the designer, and the people who worked for him were the pattern makers. For instance, Koret went to Paris and bought a lot of samples, which he brought back for his pattern makers to copy. But today, there’s nobody making anything here. This almost minimalist silver Chatelaine from 1967 is adorned only with clear crystal rhinestones. When I first arrived in the United States, I started working in a factory that made inexpensive bags. There was a sewing machine operator there who said, “You come from a place where you used the finest leathers and made beautiful things. So I think you should go talk to the head of the Handbag Workers Association and he will send you to a place that could use your talent.” So I went there and they sent me to Nettie Rosenstein, which at that time was the finest maker in the United States. I worked there for about 12 years. Of course we were scared to death, but we did it and we were very fortunate. We were very successful. The owner of Nettie Rosenstein had introduced me to most of the buyers, so I knew a lot of the customers. When I started my own business in 1963, I called them up and they came down to see me. We had a very tiny factory, only 280 square feet, with four workers. I had one pocketbook maker, a cutter, and we sent the skiving out to a place around the corner. I could make things just the way I wanted. Collectors Weekly: What was your first collection like? Leiber: It was entirely in a pale green leather. When I worked for Nettie Rosenstein, all the bags were made in one color. Each season, they had a different color. So I decided that I was going to do things the same way. I made all my leathers in a pale green that I liked very much. The children of the handbag workers all wanted to become doctors and accountants. The trade just went to hell. We had bags made in calfskin that I bought from the Ohio Leather Company, which no longer exists. There were other places that sold reptiles, snakeskin, lizards, and alligators, and they dyed the colors for me—in those days you could do that. You could order six skins of alligator to get exactly the color you wanted. We didn’t do terribly well that first season. So after that, I made every bag in a different color. We also made belts, lots of belts, which were very beautiful, and a little bit of jewelry. We mostly made costume jewelry but I also made fine jewelry for one or two years with Harry Winston, which was very nice. We became very successful 10 years after I started in the business. By the time I sold the company in 1993, we had 200 workers making about 24,000 bags a year. In 1967 I made my first metal bag. I made it in Italy. The maker sent back samples, but they were in terrible shape. They were so badly stained on the bottom that I had to put rhinestones on it in order to make it into a handbag that was salable. That’s what got me into the rhinestone business. Collectors Weekly: What was that first metal bag called? Leiber: It was called the Chatelaine. It was a tiny, round purse shape, like a purse a medieval lady would have carried around on her waist to hold scissors and a thimble and needles. Chatelaine is also the word for a lady who was the head of a chateau—the castle owner’s wife. The purse was very successful. I think we sold about 3,500 of them over the years. You couldn’t put much in it, though—a credit card, a coin purse, a mirror, and a hundred-dollar bill. 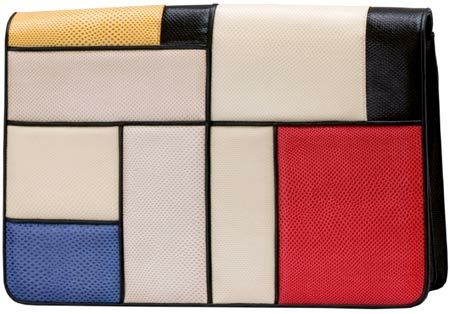 A Piet Mondrian painting inspired Leiber’s multi-colored Karung Envelope from 1990. I also made many, many leather bags. I made some wonderful bags inspired by artists—George Braque, Sonia Delaunay, Mondrian. One of my personal favorites is the Mondrian, which is a very beautiful, very simple envelope. And I’ve always been very interested in Art Deco, even as a kid. Actually, the first bag that I got the Coty Fashion Award for was an Art Deco bag that had different patterned pieces on it. I was the first woman to receive a Coty Award, and it was the first time it had been given to anyone for a handbag. I was also interested in tiny Japanese boxes, some of which I purchased at antiques shows and then re-made in larger versions. I made a bag based on a rice pail, and I also used ideas taken from the wonderful Fabergé eggs and boxes, all different kinds. Sometimes I was inspired by old handbag frames that I saw in antiques shops. They always had very strange, very soft bags on them. I would go to Italy and have them make me a frame that was inspired by the antique frames. I did very well with those. Collectors Weekly: Where was your first factory? Leiber: Right on Madison Avenue on the corner of 33rd Street. That’s where all the big companies were. Today it’s all gone. The Handbag Authority still exists, but all the people in the business are basically importers. Everything is made abroad. Nobody has a factory here anymore, very few people. Carlos Falchi is the only one, I think, who still has a factory in New York. I became the first woman to be accepted into the Handbag Guild. It was a man’s trade; I was about 18 years old. When I came to the States in 1947, there were about 500 manufacturers in the New York area. Today there’s nothing. The children of the handbag workers all wanted to become doctors and accountants. They wanted to work in other businesses. Maybe they became insurance agents. They didn’t want to work at a bench. I guess the trade just went to hell. People retired, they died. Americans are basically not in the trade anymore, which is unfortunate because when we were in business, we had people from all over Europe, from Poland, from Russia, from Germany, from France, from Italy. All the workers came from different countries, and they all did wonderful work. That doesn’t exist here anymore. Anybody who wants to make anything has to go to Italy, to South Africa, to China. It’s very different from the way it used to be. When I was in business, I used to get the boxes or the frames from Europe. I had an idea, we made a preliminary sketch. If we made animals or complicated boxes, I had a very talented designer or sculptor who would make a wax form of it. And then I would take that to the people in Florence, and they would create all the boxes that I wanted. After we received a box, we put linings into them, either gold, black, or silver, depending on the color of the exterior. And then if the bag had a pattern, I had girls who sat in one room, and all they did was put a white base on the outside of the box and paint the colors as they were supposed to be. Of course, a different group of girls worked on the beading. Each beaded bag took about a week to make because each stone was applied individually, one by one, onto the metal. Collectors Weekly: Did you and your husband work together in the early years? Leiber: In the beginning, Gerson used to write all the invoices and pay the bills. Then we were able to hire a bookkeeper so he didn’t have to pay the bills anymore. Once we got a little bit bigger, we had a shipping clerk. I remember in the very beginning, the shipping clerk took six bags to Saks Fifth Avenue on the bus. But then as times changed we had more help, and we had UPS. We sent our bags everywhere through UPS. The finest stores in the United States carried our bags: Bergdorf Goodman, Saks Fifth Avenue, Neiman Marcus, among many others. Specialty stores existed all over the country in those days. Today, many of the stores we sold through don’t exist anymore. Neiman Marcus and Saks are in business, of course, and Bergdorfs. But the small, fine, single companies, many of them went out of business over the years. Collectors Weekly: First Ladies have been very fond of your bags, haven’t they? Leiber: Yes. The first one I designed was for Mamie Eisenhower when I worked for Nettie Rosenstein. Nettie made the dress, and I designed the pattern for the bag and put it together. It was very beautiful. After I went into business for myself, I made bags for Mrs. Johnson, Mrs. Nixon, Mrs. Clinton, Barbara Bush, and Laura Bush. 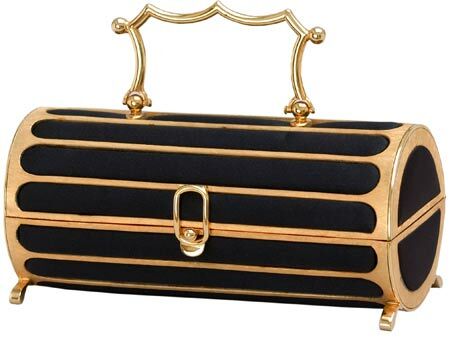 Sometimes the line between box and bag blurs, as in this gold-handled Florentined cylinder, with inlaid black satin, from 1968. With Laura Bush, I wasn’t in the company anymore, but I just did it out of friendship. I think Barbara Bush sent bags to Mrs. Gorbachev, and a few other prominent people in Europe, presidents’ wives, which was nice. I never did them as commissions; I didn’t make any special shapes. The First Ladies selected something that was in the collection, whether it was this year’s or last year’s. They picked out a shape they wanted, and we made it up for them. We just matched the clothes that they wore. We made two bags for Mrs. Reagan, and I made two for Hillary Clinton, too, but one of them wasn’t used. I think she still has it. The girl who made her first inaugural dress, who was from Arkansas, made a little bag for her, and Mrs. Clinton decided to wear that. So I think the bag I made never went into the Smithsonian, but the second inaugural bag is in the Smithsonian, which is a very, nice, little bag. My bags have always been in museum collections. In addition to the Smithsonian, I have bags in the Metropolitan Museum of Art in New York, the Los Angeles County Museum of Art, and I even have one in the Victoria and Albert Museum in London. Collectors Weekly: Did you always use Swarovski crystals on your bags? Leiber: I only used Swarovski crystals, and the Judith Leiber company, which still exists today, uses only Swarovski’s crystals. Many were of animals. For example, we made two cats, a penguin, and an anteater. We also made fruits and vegetables, including a tomato—which was a very pretty box—an eggplant, and a bunch of asparagus, all kinds of different things. For example, many of my leather bags had closings with semiprecious stones in them, very nicely made. Some of the boxes I made also had semiprecious stones on the closings, along with Swarovski crystals. After I left the company, they made one of my bags, a little rolled shape, in diamonds and precious stones—rubies, emeralds, and sapphires—but they only made very few of those because it was terribly expensive. Those bags cost a few thousand dollars each. Collectors Weekly: When did you leave the company? Leiber: We sold it in 1993. I worked for the company for five more years, and then I retired. I made nearly all the patterns until I left. I did have help toward the end. The last few years, I had two or three pattern makers working with me, but I made all my own patterns for more than 20 years. 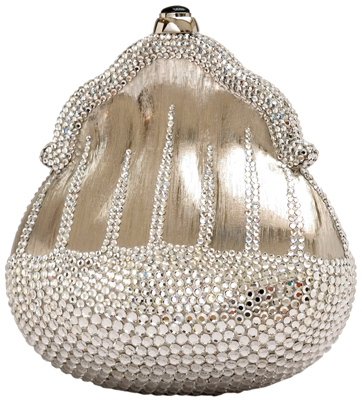 This rhinestone egg with pearls from 1988 reveals Leiber admiration for the work of Fabergé. After I left the company, I came back once and made a few metal bags. One of them was a peacock, which I made in 2004—Neiman Marcus bought 100 of them. They also bought a lot of penguins over the years. The Leiber Company still makes very nice bags. They make leather bags either in Italy or South Africa. They get their boxes from Florence and the beading is done in Thailand. It’s very far away, very different than it used to be. When I was in business, we had 100 girls who just did the beading, and another hundred people who were in the handbag factory doing the shipping and running the office. I sold the company to Time Products, which was a watch company in London. They sold it to Pegasus Company, which then sold it to a gentleman named Jay Schottenstein from Columbus, Ohio. Today the president of the company is Mary Gleason. She’s a very talented, very nice lady, and they are making very nice bags. The bulk of them are beaded bags. They make less leather and silks, but they’ll eventually get bigger with the leather, too. When I had the business, half of it was leather bags or silk and the other half was beads. I think they probably do 60 or 70 percent of beaded bags today. Things change, I guess. Collectors Weekly: Where is your museum? Leiber: It’s in East Hampton, on Old Stone Highway. We are only open from Memorial Day to Labor Day, usually in the summer, only Saturday and Sunday, from 1:00 to 4:00. This season we have an exhibition of Japanese prints in the big room. The museum also has the Chinese art collection that we started in Budapest, the first year we were married. Back then we bought a little vase for a dollar. I took it up to I. M. Chait—the famous people that sell Chinese art—and they said it’s worth about $7,000. It was a pretty good buy. We originally had our Chinese collection in New York, but we brought it out to the country and built a special room for it. It’s going to be there in perpetuity, along with my bags. Next year, in 2011, my husband, who is a fine artist, is going to show all his drawings in the big room. That will be a very interesting show. And the year after that, the whole museum is going to be filled with only my things. We’re going to put out a large collection of pieces that are upstairs now, put away in closets. So it will be more than the 200 that are currently on display. When I sold my business, I had to turn over all my models to the new company. So I’m still buying bags on eBay and in auctions, whenever I find something that we would like for our museum. Collectors Weekly: Who are your favorite contemporary designers? 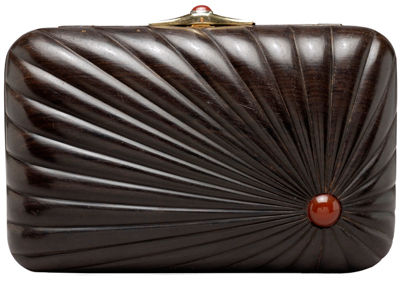 Though her factory was in New York, Leiber shopped the globe for the best materials and artisans. For example, this ebony box from 1981 was carved in India but features Italian hardware. Cornelians accent the lock and side of the box. Leiber: Bottega Veneta is very good with handbags. Gucci is very, very popular. But I don’t worry about any of that anymore. I feel that my time is taken up by the things that I’ve done. So I don’t really care very much in general about what they make today. Some of the stuff being made these days is horrible. There are very few bags that really look good. People go to the Metropolitan Opera in jeans with a fancy top, fancy blouse, and high heels. And they wear these enormous bags that really don’t fit. Years ago at the Metropolitan Opera, we only counted the bags that weren’t ours. Today you see one or two pieces that are ours, very few. Things have changed a lot. Thank you for a very informative article. 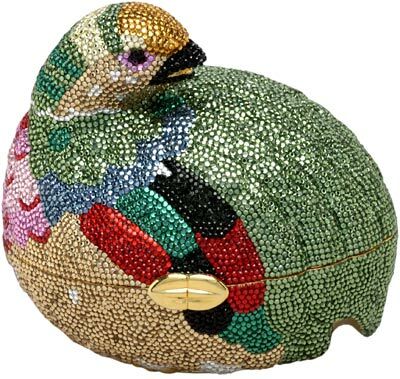 I have developed quite an extensive collection of Judith Leiber handbags, pillboxes, compacts and other items. I have been searching for information on how to date the older pieces. Can you assist by directing me to any authority that I can use in my reserach of the older pieces? Thank you for your time and assistance. Please forward your archival inquiries to info@leibermuseum.org. 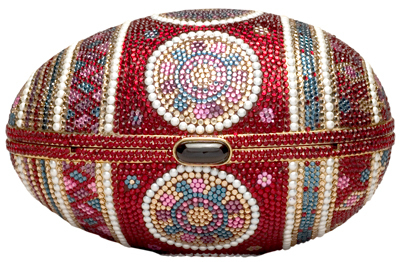 Please note: The Leiber Museum does not appraise, sell or repair Judith Leiber® merchandise. Judith Leiber LLC cannot be reached through The Leiber Museum, and any inquiries concerning that company, including matters relating to the purchase or repair of products, should be made directly to Judith Leiber LLC. I can’t believe they made her give up her own collection when she sold the company, that just seems cruel! If I find another Leiber, maybe I should offer it to her. As an amateur fashion historian, this has been a fascinating, and eye-opening article. I appreciate the generosity in Ms. Leiber’s willingness to share her history with the public. And, as always, kudos to Collectors Weekly for always having interesting and informative articles to tickle our own imaginations! I so very much enjoyed reading this article. I have been fortunate to own 3 Judith Leiber belts which are beautifully adorned. They are so unique in the way they clasped and they fit beautifully due to the sliding effect. Love them – each time I wore one, I felt so special! I own the Chatelaine . One crystal is missing. Any idea how I can get this repaired please? What type of glue is used for the crystals on a metal purse? Thank you. “ ” The bottom dropped out when Boyd Grafmyre stopped promoting shows at Eagles.